We had a cedar chest here and can not get over how much we have now. Totally worth the money. It more Beige then gray. 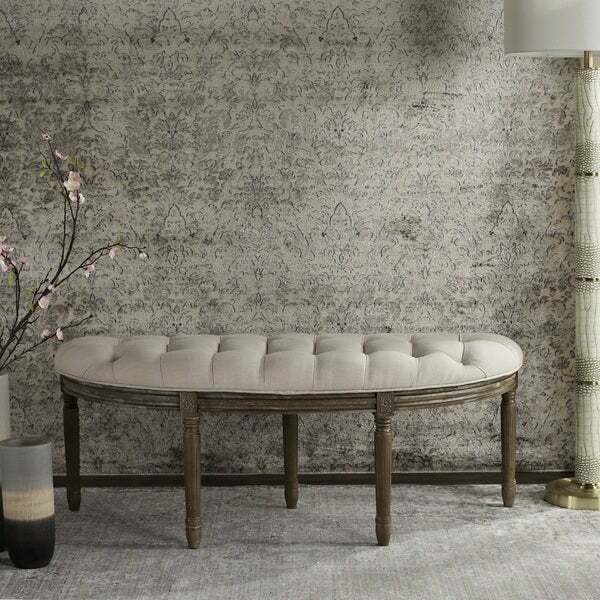 Alive with the timeless elegance of the finest French furnishings, this semicircle bench was inspired by pieces in Paris' decorative arts museum. Finely crafted natural wood details are paired with classic beige upholstery to create an instant focal point. Dimensions 50" x 19.25" x 19.25"
The positives; It is pretty and made with good wood and fabric. It was easy to put together. Cons; The fabric is not 'greige.' It is more goldy beige. 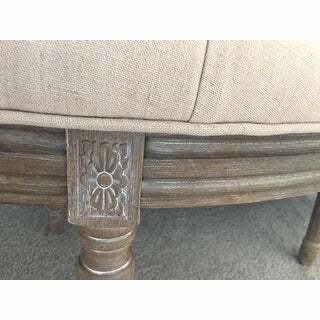 So disregard the initial picture on Overstock and go to the last few. I will keep it. Very easy to assemble. Great looking bench. I love this bench! It looks perfect in my foyer and I couldn’t be happier! I ordered it online on a Sunday and it was supposed to be shipped to my house on Friday and it came early on Wednesday which was very nice and convenient. I was notify with the delivery every day which was a little much but hey we’re just emails so no big deal! Great bench! Beautiful bench! The tufting is very nicely done. Super easy to assemble. This bench looks perfect at the end of my bed. It was easy to assemble in minutes and is very sturdy. I highly recommend this item especially for the price! This is a really beautiful piece of furniture. It's presence graces any room, and coordinates well with just about any decor. It looks fabulous in a front room or entrance as a simple bench, and looks just as wonderfully at the head of bed. So many uses for this simple piece I may have to order a another. The beige is on the gray side which is so hard to find. This isn't flimsly by any means, and is quickly and easily put together. It's really an amazing buy for people both young and old. Even prettier in person than it appears online! It looks great in my hallway and was super easy to put together. The fabric is a warm beige and the wood is a light grey that will go with many styles of decor. I absolutely love this bench! It is a very nice piece of furniture. The fabric doesn't quite look as gray/tan as the first picture on the product page shows, but it is more similar to the rest of the pictures. I love the Safavieh brand overall. I've been happy with every Safavieh product I've purchased. I returned this item because the fabric was loose looking just by running a hand over it right out of the box. I decided not to chance sitting on it because it would only look worse over time. Perhaps this was just a flaw in the one I received. This bench works beautifully in so many locations. I have put mine under a window of a guest room. It is solidly built and would make a nice addition to a foyer, hallway, or at the end of a bed. The colors are soft and versatile. I am thinking about getting another one! Be forewarned that this is a much darker beige than portrayed in the image online. This was a well made piece of furniture and had I liked the color I would have given it a much higher rating. 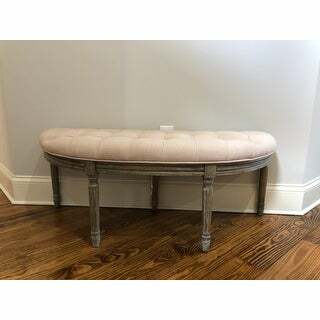 Waiting for this gorgeous bench to arrive, its for my bedroom. 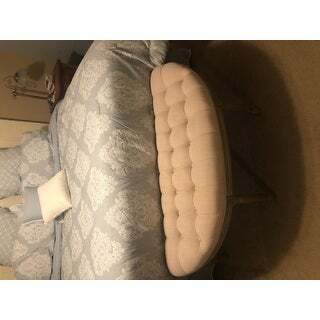 Pefect match for my bedroom set. Simple yet very elegant !!! I love the style and look of this settee. I have cats and it was so difficult to prevent torn furniture. I finally found the perfect solution to seating and no scratching. I have a small alcove where the curving staircase bends, so I put this in backwards (with the curve in the back and it fits perfectly. The wood is a bit rough, though. Fabric is a little on the gold side. I expected more of a gray. Looks great, just as promised. "Can anyone help with some guidance on how "curved" is the circular part of the bench? I'm trying to gauge if it would fit my bay window well..."
"Is the cushion removable for washing?" The cover is not recommended to be washed. "Is the color a light beige or more taupe?" 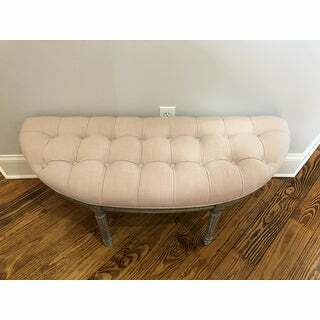 It is 50 W x 19.25 D x 19.25 H.
How to Repaint a Bench from Overstock.com. Our guides provide customers with information about how to repaint a bench.